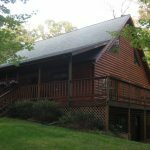 What it’s heating: We have a 2″x6″ framed log cabin style home w/ loft and 28′ ceilings, walkout basement and a 12/12 pitch roof. The house footprint is 32’x42′. See attached photos of the house. I did an online energy loss calculation and to keep the house at 70° in 0° weather it requires anywhere from 46,000 BTU’s/hr (tight construction) to 69,000 BTU’s/hr (loose construction). The house is not what I would consider tightly constructed. It doesn’t even have vapor barrier behind the log siding. There is also no attic to be able to insulate and has about 10″ separating the inside of the ceiling from the outside. There are areas which also have insulation issues, as when it gets real cold out ICE will literally form on the INSIDE walls in those isolated areas. Before I was in the picture, she kept the house at 68° all the time and averaged 1,300 gallons of LP a year from 2005 through 2009 (max of 1,500 gallons in 2008) before I came along. Assuming 200 gallons of that went to the water heater and dryer a year, using 1,100 gallons of LP in a 92% efficient LP furnace equates to about using 4.6 cord of red oak in an 82% efficient wood furnace. Remember this……roughly 4.6 cord of wood to keep the house 68°. 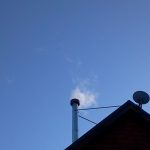 How I decided on Kuuma: During the winter of ’13/spring of ’14, I decided to look around and see what my options were for more efficiently and effectively heating our home. We had a fair amount of good oak firewood and it just did not feel right to keep wasting it in the fireplace. I called a local hearth and home place and had them come out to give us an estimate on replacing the fireplace with a high-efficiency fireplace insert. Turns out our current fireplace manufacturer would not recommend installing an insert. So the only other option would have been to completely tear apart the brick hearth and rip out the old fireplace and replace it with a high-efficiency one and rebuilt the hearth. This was going to cost way more than we wanted. It was then when I decided to look online for other options. I then ran across Hearth.com and started searching. This is where I first heard of the Kuuma Vapor Fire 100. I did as much searching as I could on the company and furnace and could not come up with a single bad review. I private messaged a couple current owners of the furnace and even used Kuuma’s testimonial page on their website to look up and call those who have left their own reviews which were around the Wisconsin area. Out of the handful of owners I spoke with, not one had a bad thing to say about their furnace or the company itself. I also called and spoke with Daryl himself about my situation. He was very honest and pretty much told me I was “lucky the house was not any bigger” when I asked whether he thought it could handle the heat load. I was now very intrigued and started doing, even more research and figuring out if it would even work in our house. After a couple months of doing my due diligence and in addition trying to convince the other half that this was a good idea, I pulled the trigger. I ordered the Vapor Fire 100 WITH water coil at the end of March 2014. I believe I took delivery sometime in June. The whole ordering and delivery process was painless. Everything came well wrapped and protected. 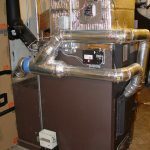 Install: I did the actual furnace installation myself. 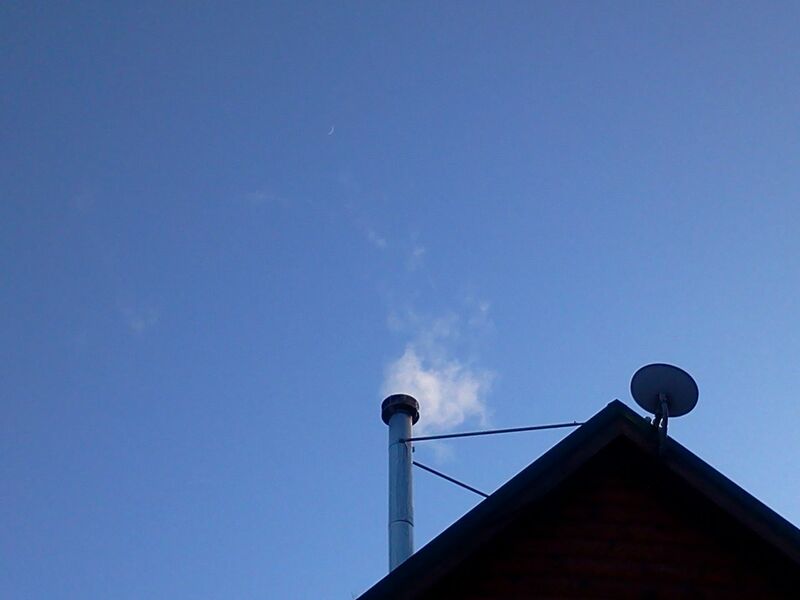 I had professionals put in a new chimney and plenum. Installation was pretty straight forward. One must make sure to follow the owners manual to make sure to pay attention to the few electrical connections you must make. Draft, is also very important and it’s why a barometric damper is included with the purchase of the furnace. I HIGHLY suggest picking up some sort of manometer to monitor your draft to make sure the barometric damper is adjusted correctly and is keeping your draft at 0.06″ W.C.. I use a Dwyer Series Mark II 25. One must also make sure you use backdraft dampers (gravity or powered) to avoid back-feeding either the LP furnace or Kuuma. You also need to allow for gravity flow of hot air in case of a power outage. I tied into the existing main supply duct and have a spring open/powered closed damper in the supply duct in between the Kuuma and main house duct. I do not have my return air tied into the house return air. I’m using an open staircase for my return air. I have my powered damper wired to only close when the LP furnaces blower is the only one which is running. This allows both furnaces to seamlessly work together and for the LP furnace to kick on if it ever needs to when the Kuuma’s blower is also running in order to keep the house at a minimum of 68°. It performs just like Daryl said it would. It’s EXTREMELY easy to operate, thanks to the computer-controlled automatic primary air damper. 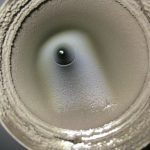 There is virtually no smoke when it’s above 32° outside and under 32° it looks like a huge dryer vent, emitting what looks to be mostly water vapor (which is a byproduct of combustion). See attached photo showing water vapor being emitted on a cold day. The computer on it allows you to control how much heat output you want, from low to high. It has a variable potentiometer; meaning you have more than just three settings to control how much heat you want. It’s marked low, medium and high, but you are not limited to just those three settings. The computer uses a thermocouple to determine real time firebox temp and automatically adjusts the primary air (which is controlled by the computer) for whatever rate of burn you have it set at. The hotter you have it set the more air it allows in through the damper and the more heat you will get. Once the computer senses internal firebox temp meets whatever heat setting you have it set at, the computer closes the primary air damper and then the pre-heated secondary air pretty much solely feeds the fire. This is when the gasification takes place and the burn is clean, hot and efficient. The draft is auto regulated by use of a barometric damper which should be set to 0.06″ W.C. There is a two-speed blower, which is controlled by an included wall-mounted thermostat. When the plenum temps reach the set temperature of the low limit switch, the switch energizes the blower circuit and turns the blower on low. When the wall thermostat calls for heat, the blower system automatically kicks on high. When the temperature is satisfied and the thermostat “kicks off”, the blower system switches back to low where it stays until the thermostat calls for heat again. All this means you can fill it full and not worry about adjusting anything but a little dial to control the heat output you want. The burn times are dependent on what heat output setting you have the computer set at as well as how much wood you put in the firebox. More wood + low setting = longest burn times. During the winter I usually do three loadings. One at night, one in the morning and then a small one around 5 pm to take me to the night loading. How much wood in each loading is dependent on how cold it is and how much heat you want out of the furnace. I can tell you, though, you can pack the Kuuma to the gills (70+lbs of oak), put it on absolute, maximum burn and you will still have 9+ hour burn times. It is physically not designed to burn wood faster than that. It’s designed to maintain a controlled and efficient burn throughout the burn cycle. Seeing it’s air damper is controlled by the computer, it burns as efficiently and as clean as possible. Room temperature has no bearing on the level of burn. Other furnace brands have the room thermostat tied into the air damper and when the thermostat calls for heat the damper opens to speed up the burn rate and heat output. This way of doing things decreases overall burn times at the benefit of more heat but also more emissions and less efficiency. Performance: Starting in 2015, I began weighing all my firewood before I loaded it into the Kuuma. I also started keeping track of how many minutes the LP furnace ran by use of a minute counter. I keep track of all data by use of a spreadsheet. All wood, with similar moisture content, contains the same BTU’s per pound. This allows me to compare year to year and also compare it to those years in which we used LP. Remember above when I mentioned to remember “4.6 cord of wood to keep the house at 68°” when I converted our yearly average LP usage over 5 years into approximate cord wood? This is where it comes into play. We keep our LP thermostat set to 68° and the LP furnace will run if it needs to, regardless if the Kuuma is running or not. The winter of 2015-2016 we burned a total of 4.3 cord of red oak and 38 gallons of LP. Of those 38 gallons, only about 5 gallons were used to supplement heat. The rest of the LP was used when we were not home or during the Spring/Fall when I didn’t have a fire going. This means over 99% of the heat, when we were burning wood, came from the Kuuma. So far during the winter of 2016-2017, I have used 2.75 cord of red oak up to February 11th and 4.4 gallons of LP to supplement the Kuuma. Once again, over 99% of our heat has been by way of the Kuuma. Also, the temperature inside the house very rarely drops below 70° now. Usually, if it’s below 70° it happens on cold mornings when the Kuuma is ready to be re-loaded. The same goes for those times when the furnace runs to keep the house 68°, this normally happens on very cold mornings when the fire is dying down and needs to be re-loaded. When the furnace does kick in on those mornings, I will normally let it run for an hour or two in conjunction with the freshly reloaded Kuuma in order to bring the house temperature up quicker. So in reality, the LP furnace probably runs longer those mornings than it would have if it was simply maintaining 68°. The Kuuma also heats the basement solely with radiant heat. We never heated the basement with the LP furnace, we always kept the supply vents closed. As mentioned, we have the optional water coil which heats and thermocycles the water in our 40-gallon tempering tank (see photo). This tempering tank then supplies our water heater with pre-heated water. We recently had company stay overnight. We were into our 4th and last shower that next morning when the water heater finally kicked on. So we can basically get 3+ free showers a day. Seeing there are just two of us, we pretty much get free showers every morning when burning 24/7. Over almost 13 months last year, we used a total of 135 gallons of LP. As mentioned above, approximately 38 of those gallons went to the LP furnace, the remaining 97 gallons went to heat our water and dry our clothes. So, on average, we use about 8 gallons of LP a month between the water heater and clothes dryer. The water heater uses more LP in summer than it does in winter, thanks to the water coil. 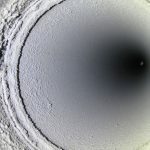 After the first winter of burning, I decided to take a peek at my chimney. I attached those pictures as well. All you see is white/gray fly ash. This was over the entire burning season. I did not clean my chimney. After the second burning season, I checked again and saw the same thing. This time, however, I decided to run by brush up and down the chimney. All I got was fly ash. What I learned: If your install is like mine and you are not tying into your cold air but using an open staircase, I STRONGLY suggest you don’t just leave the cold air intake down low on the basement floor. I did this my very first year of burning. 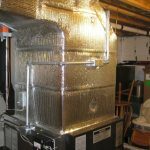 During the second year, I boxed out the cold air intake and raised it up to about 6″ or so below the top of the basement floor joists in order to take in the warmer air off the basement ceiling. This increased my cold air temp noticeably and hence my supply temps also increased. I also am reclaiming some of the radiant heat off of the furnace face and mixing it into my cold air, this increased my supply temps even more. Doing this did not have any ill effect on keeping the basement heated, as the basement still stays plenty warm. I would also move the low limit button switch from where it is factory to someplace up higher in the plenum. Heat rises, so the sensor more accurately senses the heat coming off of the furnace better as compared to being on the side. The blower will turn on/off more consistently. You then can raise the low limit setting up to 110°-115°. Your duct static pressures also may come into play. If you have too much airflow through the furnace, then the air won’t have time to properly heat up and you will have low supply temps. Just something to think about if you think your supply temps are too low. Dry wood. You will need properly seasoned and dried wood. If you use too wet of wood the gasification process will be quenched by the excess moisture being turned into steam. You will never achieve optimum burn if using too wet of firewood. When starting a fire, I use kiln dried dimensional wood scraps from the local truss manufacturing plant in which I have free access to. These work FANTASTIC in starting fires. They also work great when trying to burn down coals, as placing them on top of the freshly forward raked coals will increase combustion air which will help burn the coals down faster. Seeing the woods scraps are kiln-dried pine, they will not add to the coals. Don’t ever be reluctant to contact Lamppa Manufacturing and speak to Daryl if you have any questions and/or concerns. He is a stand-up guy who is very proud of his furnace and will help out if you ever have any questions or issues. People always ask me if I were to do it over again, would I do anything different. I can honestly say I would not. This furnace is absolutely fantastic! I am a first-time wood burner, and the only learning curve involved was learning how much wood to load when it got a bit warmer so you don’t overheat the house. It truly is load and go. No messing with dampers or air inducers trying to keep the fire burning optimally. All the guesswork is taken away thanks to the computer. The only regret I have is I wish we would have purchased it one year sooner, as we could have avoided that particular winter’s extreme LP prices.